Cristobal as in BALENCIAGA, would be so proud! 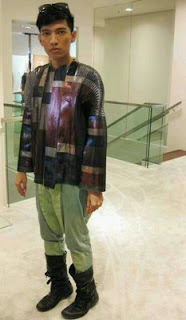 Here we have famed blogger BRIAN boy giving this f/w 09 piece a test drive. Being a savy fashion fortuner, he real eyes'd it was on sale and nabed it. Straight out Milan people! Oh yes, itls getting serious. I was on twitter the other day and read the funniest post from Brian boy himself, it stated that he was stopped by customs due to a unknown piece in his luggage. Only for him to find that it was nothing more than a oversized (rare) python clutch. I laughed upon reading his tweet only because he seemed so flustered with his airlines. (Trust, I know how it feels!!) To top it off, his luggage was over the given weight requirement.Next thing you know I read a tweet talking about him being in a Paris airport shelling out clothes left and right. All I could think about was all the unrelaesed couture being pulled out and shown to the public eye...ha. Where's the paparazzi when you need em'. Dxmn. Fashion and the people in it tickle me sometime!! As a last note, you should follow Brian on twitter, he's been geting great coverage on this past milan Fashion Week and trust, you don't want to miss any more of his travel blunders! !